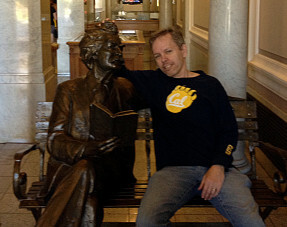 Actually, the Twain statue is just inside the main entrance of Doe Library at UC Berkeley. I asked the nerdy-looking Asian girl at the front desk, “Who’s the guy on the bench?” She stared at me for a second. “Kidding,” I said.